Sick of hearing about Sweden's excellent healthcare and education, and looking at Swedish people's glowing, high-cheekboned faces? Well you'll be happy to hear that they're falling for a ridiculous trend: sleeping on nail beds. The New York Times reports that modern-day nail beds, with little plastic spikes are being touted as a cure for everything from "from schizophrenia to dandruff." 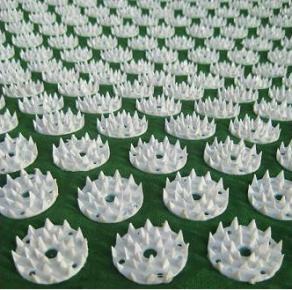 The nailbeds, which are little rubber mats of evil, came from the yoga community, sell for between $50 and $115 and one company is manufacturing 100,000 a year. Over 3000 people gathered in a park to lie on them and break some kind of incredibly obscure world record. But not everyone is happy. Some people need 'evidence' before they believe things. Motherfuckers. In a recent commentary, the conservative newspaper Svenska Dagbladet wrote that there was "nothing that even approaches a scientific proof for the effects" of the nail mat. Which may be why Ikea are not selling them. Yet.